This cake. I can’t even be alone in the same room with it. I originally developed this for Clean Eating Magazine’s April 2017 issue and I have been finding excuses to make it for several months now — my daughters coming home for spring break, Jenni Kayne’s Easter brunch, having friends over, going to a potluck. Even though one cake would have been enough for Passover, I made two. 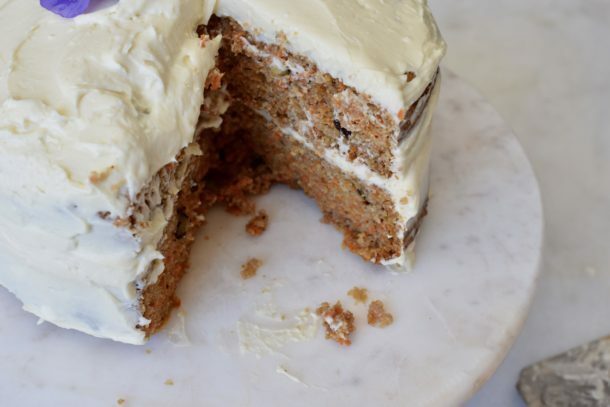 This cake changes the grain-free game. I love a good carrot cake, one that’s dense, moist and lightly sweet, with crunchy walnuts and soft raisins. This one does not disappoint and there are no grain flours or dairy in the cake whatsoever. Quite honestly, I am starting to prefer grain-free baked goods. They stay moister for longer and can be refrigerated without compromising texture. Plus, the base is usually almond flour which has loads of protein and good fats, neither of which are plentiful in wheat flour baked goods. I am not embarrassed to say that I have eaten this cake (without frosting) for breakfast and I find it to be quite satisfying and energizing. For Clean Eating, the recipe was developed with standard cream cheese frosting (and let me add my frosting is way less bad for you than a standard cream cheese frosting with butter and a bag of powdered sugar.) But for Jenni and her friends, I did an almond milk cream cheese frosting, which I thought was divine! I buy Kite Hill almond milk cream cheese from Whole Foods and it’s slightly saltier than normal cream cheese, but you know how I like my salt! I had fun decorating this cake although styling food is not my forte. I always keep things simple. You can see from the above images that in one I used a fresh flower with julienned carrots and pumpkin seeds, and the other has just multiple edible flowers. For Passover, I crushed freeze-dried mangoes and sprinkled them around the border of the cake. On the cake plate, I arranged chamomile flowers. Again, springy and simple. You can freeze this cake, well-wrapped in plastic wrap and then foil, for up to 3 months. Thaw in the refrigerator. I even froze a cake with cream cheese frosting on it and served it for Passover. Shhhh! Don’t tell. Feel free to cut the recipe in half and use one cake which you can split in half and frost to create a thinner, but still 2-layer, cake. You can make muffins too, or cupcakes (basically muffins with frosting, right? ), and just cut the cook time. I haven’t done it, so you’ll have to wing it. 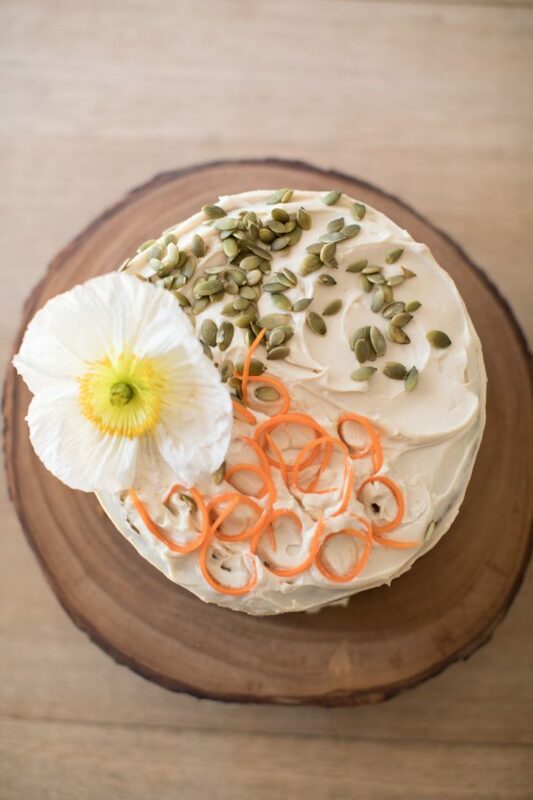 Hope you all have a lovely Easter Sunday and that this carrot cake might grace your table this year! Preheat oven to 350 degrees. Grease 2 8-inch round pans. If desired, line the bottoms with unbleached parchment paper as well. In a large bowl whisk together the almond flour, arrowroot, coconut flour, spices, baking soda, and salt. In a medium bowl, whisk together the eggs, maple syrup/honey, coconut oil and vanilla. Pour into the almond flour mixture and combine well. Stir in carrots, walnuts, and raisins. Pour into prepared pans and bake 40-45 minutes until just set and a toothpick comes out clean or with dry crumbs. Cool 5 minutes in pans before turning out onto a cooling rack. Cool completely before frosting. Prepare the frosting: in the bowl of a mixer, beat the cream cheese, maple syrup, and vanilla until light and fluffy, about 1-2 minutes. Place one cake on a cake plate and cover the top of the cake with half of the frosting. Place the second cake on top and use remaining frosting to ice the top of the cake. Can I make this recipe as is in to muffins? Yes! Line with parchment liners. Fill almost to the top. Bake for a little less time, but you’ll have to wing it. Check after 25 minutes. I recently made this cake for my parent’s 31st wedding anniversary. I’ve made a lot of Paleo cakes, but they said this is the best one yet, and I agree. The cake is perfectly moist and delicious. When it’s served right out of the fridge, it feels similar to eating cheesecake (I doubled the frosting and made 4 layers out of the 2 for extra creaminess). We almost ate it all in three days! Thank you for this stellar recipe! I am so delighted you chose to serve this for such a special occasion and I am thrilled everyone enjoyed your hard work! If I’m making 12 cupcakes should I cut the recipe in half or no? Thanks! If you cut the recipe in half, I am guessing (based on my other grain-free muffin recipes) that you will only get 9-10 cupcakes. This cake was delicious!! Super moiste and just the right amount of sweetness. It was a big hit! I will definitely make it again! Can you make any parts of this or all of it a couple days ahead of time? Yes! You can make the cake two days ahead. Wrap each cake in plastic wrap and refrigerate. Make the frosting two days ahead and refrigerate, covered. The frosting will firm up, so try to let it sit out at room temp to soften before spreading. Hi, looks yummy and trying this tomorrow. Could I sub toasted coconut for raisins? Sure! Or just leave the raisins out or sub some diced pineapple. my daughter requested this for her birthday, she remembered it from last Easter! was wondering if it’d work to make into cupcakes?? not sure of cooking time and all that jazz…need things pretty spelled out! thanks so much!!! Sure you can! I don’t know cooking time either since I haven’t made these into cupcakes (at least I don’t think I have.) But I would start testing them at 20 minutes. Push lightly in the center of a cupcake with your fingertips and make sure it’s firm and springy. Hi Pamela! Do you think I could make this with regular gluten free flour instead of almond flour? I have a slight almond sensitivity. This cake is pretty yummy. My mother-in-law loves carrot cake so I tried it to see if she would like me to make it for her birthday. She liked it so I made this cake twice in a matter of a week. I made it the first time in the two layer and the second time (for her birthday) I made it in the 9×13 pan. Both tasted fantastic. The frosting was perfectly sweet. The cake, as you had mentioned, was not too sweet and you could taste all of the ingredients which I loved. It was moist and paired well with a little vanilla ice cream. I froze a portion of the sheet cake for another day when we need a nice treat. As always, thank you! How nice! And I’m glad you think this is sweet enough. Me too! It was very easy to make once you have all the flours in your pantry which I also use for sweet potato pancakes. That is great! It’s definitely not as sweet as a traditional carrot cake and has a different texture, but I actually prefer it. Good job! Can I use almond meal instead of almond flour. I have a difficult time finding almond flout. Thank you!!! This was one of the most WONDERFUL cakes ever! 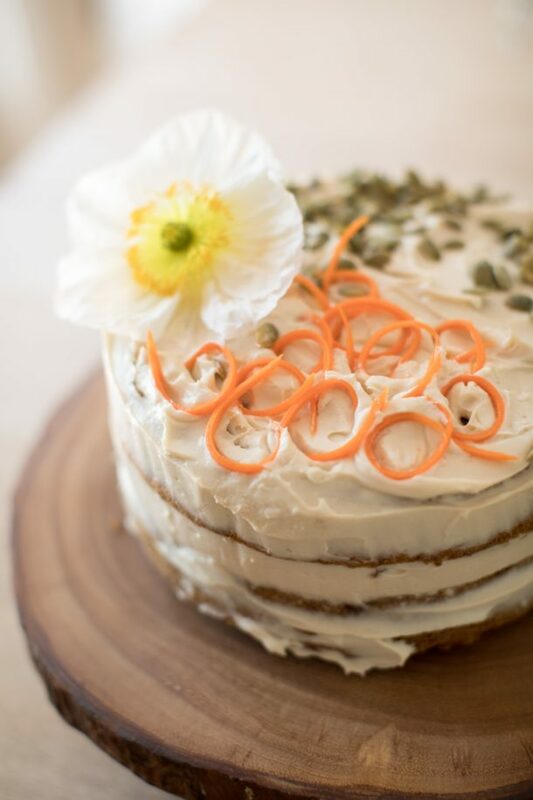 I thought my carrot cake eating days were at a sad end (no dairy, no sugar, no wheat…) This cake was pure deliciousness AND my husband loved it too! He didn’t want to like it, wasn’t sure that he wanted to try it, but I came home to an empty cake pan and a big smile from him. I can’t use maple or honey so I used the same quantity of organic coconut nectar. I also used the Kate Hill almond cream cheese- awesome. One thing I boldly did (bold for me), I made it into one sheet cake as opposed to 2 round cakes and although yours really looked beautiful, I was so happy with the ease of one cake. Your message made me so happy! And I am thrilled to know that the recipe worked well in a large cake pan, I assume a 13 x 9. You will make this next Passover, for sure! Yes, it was a 13 x 9. I do have two questions. One, I know you are not a friend of aluminum, so would you use a glass 13 x 9 dish? Two, I completely winged it regarding baking time, and I have a very old Merritt O’Keefe that DOES NOT keep its temperature. Simply so I can note it on my recipe (which I’m making again tomorrow for my sister’s surprise birthday), can you give an estimated guess on what the cook time would be for a 13 x 9? I use Pyrex, enameled cast iron or ceramic casserole dishes. I would guess you just have to add another 5 minutes. Push the center of the cake and bake until it is springy. Delish Pamela! I made this cake yesterday with the almond cream cheese option and am so impressed! It almost feels guilt free and is so satisfying. Thanks for sharing. FYI you left out the arrowroot powder in the instructions. YIKES! Thank you . Just fixed it. This cake is amazing! I love carrot cake but it usually is pretty heavy. However, this cake is moist, substantial and so delicious!